Although he lived and died in obscurity, H.P. Lovecraft inspired horror and sci-fi authors including Stephen King, Robert Bloch (Psycho), and Robert E. Howard (Conan the Barbarian). His legions of fans around the world have remained devoted for nearly 100 years, thanks to his epic mythology of horrifying creations, such as the monster-god Cthulhu and the forbidden book The Necronomicon. This illustrated biography showcases Lovecraft’s handwritten manuscript pages alongside rare photographs, hand-drawn maps and sketches, and revealing anecdotes. The text explores Lovecraft’s isolated life and the devotion to both science and writing that led him to populate the unimaginable depths of the cosmos with eldritch reminders of humankind’s insignificance: Cthulhu, Yog-Sothoth, the shoggoths, and more. A final chapter discusses his explosive posthumous career as an icon in his own right in popular and underground culture, influencing fiction, music, gaming, comics, and film. S.T. Joshi is the author of The Weird Tale, The Modern Weird Tale, the award-winning H.P. Lovecraft: A Life, and other critical and biographical studies of supernatural fiction. He is also the author of the limited-edition expanded two-volume biography I Am Providence: The Life and Times of H.P. Lovecraft. Joshi is the editor of the Lovecraft Annual and has edited several anthologies of Lovecraft-inspired fiction. H.P. 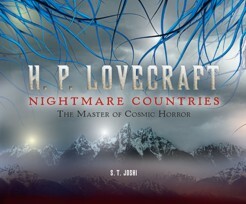 Lovecraft: Nightmare Countries. By S.T. Joshi. New York, NY: Metro Books; 2012; ISBN 978-1-4351-4152-0; hardcover, 160 pages.